Pink is not exactly my fav color. I have always been a red girl. Red car, red shoes, red couch. But, now I have every reason to love pink. Piglets are pink. CaraCaras oranges are “pink.” Daisy is oh-so pretty in pink (even with her rockstar ballerina pirate smile). And I’m celebrating my first anniversary as a breast cancer survivor. While it has not been the easiest process, I have been so lucky in having a devoted family, supportive friends, state-of-the-art medical attention and chocolate. Yes, CHOCOLATE. The champion cure-all. During treatment, when my taste buds were hibernating, everything tasted like sawdust. But, Lindt tasted real. That’s proof right there of a god or gods and goddesses, lots of them, watching over us. A lot has changed in the last year. Household chores take the backseat to my dancing in circles with Daisy or kicking the ball around with her. Another big change is that baking got promoted and for several reasons. With cooking, I like to taste as I go, just to be sure everything is in place…salty, sweet, tangy, spicy in good balance. But, since everything tasted bland when I was getting treatment, baking became my refuge. Focus is not my strong suit when it comes to recipes and cooking is very bendy to changes. But, in baking, you have to stick with the recipe which was a bit of a challenge for me. Luckily, my episodes of insomnia were put to great use by working on my skills well into the wee hours of the night. One of the best things that came out of those quiet nights in the kitchen was something I have been saving for a special occasion like today. We are not just celebrating my success. This one is for ALL the Pinkies out there. And what better way to partay than with a pink piggy taking a “mud” bath on top of CHOCOLATE cake?! Now, there you go, worrying all about your figure. But, you know I save the best stuff for you. This one is purely vegan, all natural and guilt-free. Vegan is not my trademark, not only because I love evil stuff (like cream cheese, butter, sour cream), but also because I do not have experience with specialty ingredients that are staples in strict vegan households. So, the plan is to keep it simple, stay with the basics. And since it turned out FABULOUS, I knew this one was worth sharing with you. I made the first one with a friend who was visiting from Japan. The second one went to the office. Both disappeared so fast that I didn’t have a chance to snap a pic of a slice. This fancy little number is old-fashioned to the core. It can be made with a simple bowl and wooden spoon, the way Grandma baked before there were any food processors, blenders, mixers. And, the vinegar reacts with the baking soda to provide leavening without tainting the beautiful chocolaty taste. Rummage through your kids’ toys for some plastic piggies. After a good wash, they’re ready to dive into a chocolaty mud bath on top of this lovely cake. Make one tonight with the kids. No eggs. No butter. No kidding. Note: Orange compliments chocolate oh-so-well, but you can omit the juice and zest if it’s not your thang. The pink roll cookies are available at Middle Eastern grocery stores, usually in the cookie aisle, top shelf. Grease and flour 2 cake pans. Line the bottom with a piece of parchment paper cut to fit. Sift flour, cornstarch, cocoa together. Combine sugar, vanilla and orange juice (or water) til smooth. Gently incorporate the flour + starch+cocoa into the mix, but do not overwork the batter. Finish with the baking soda, then vinegar. Divide batter between cake pans and transfer to warm oven. Bake ~30 minutes, until you can smell the cakes. Wait 10 minutes before flipping them onto a rack to finish cooling. pulp on top into a bowl. Add the rest of the ingredients and mix until smooth. Cut several strips of parchment paper and arrange along edges of a cake plate. Slice the cakes horizontally into 4 layers. Place the bottom layer onto the plate, cover with a bit of frosting, top with another layer, apply frosting until all 4 layers are stacked on top of one-another. Frost the sides and prop piroline cookies around the cake to build a pen for your piggy. Tie a pretty ribbon around the cake to keep the pirolines in place. Nestle a toy piggy into the chocolate “mud” and off you go! A bit of kitchen chemistry turned out a bouncy, moist cake without all the fuss. It only TASTES like it’s bad for you. Chocolate cake without the guilt. That alone is reason to be happy and celebrate! The statistics are astounding with 1 out of every 8 women diagnosed with invasive breast cancer every year in the States. That means someone you know may be affected by breast cancer. And, don’t forget to take care of #1 – Book that mammogram today! Lovely cake to celebrate such a lovely occasion, it is cute and pink and adorable, awesome as you!! And I always support breast cancer, any cancer research for cures 100%!! That cake is ADORABLE. 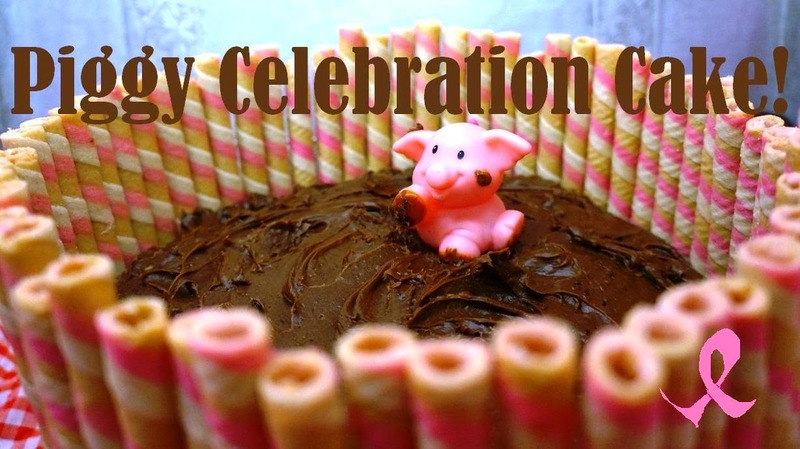 I love how the little piggy is wallowing in chocolate fudge frosting!!! My dear Colette, what a wonderful celebratory cake – it is cute, pretty, delicious and it is fun – everyone in our house would go crazy over this cake! What a milestone, dear friend – I applaud you for your strength and happiness and we are sending you the biggest hugs, tons of love and so much more! Now let´s take some time to celebrate with you – even from far away! Oh, yes, that piggy is happy, happy, happy! This is an amazing cake for an incredible celebration! Here's to many many more years of making this or some other pink cake to celebrate the years of being healthy! I'm with you when you said something about butter, cream, cheese and cream cheese. I can live without meat but not dairy :p Nevertheless, I like to be animal friendly too and adore your piggy mud-bathing cake 😀 So cute! 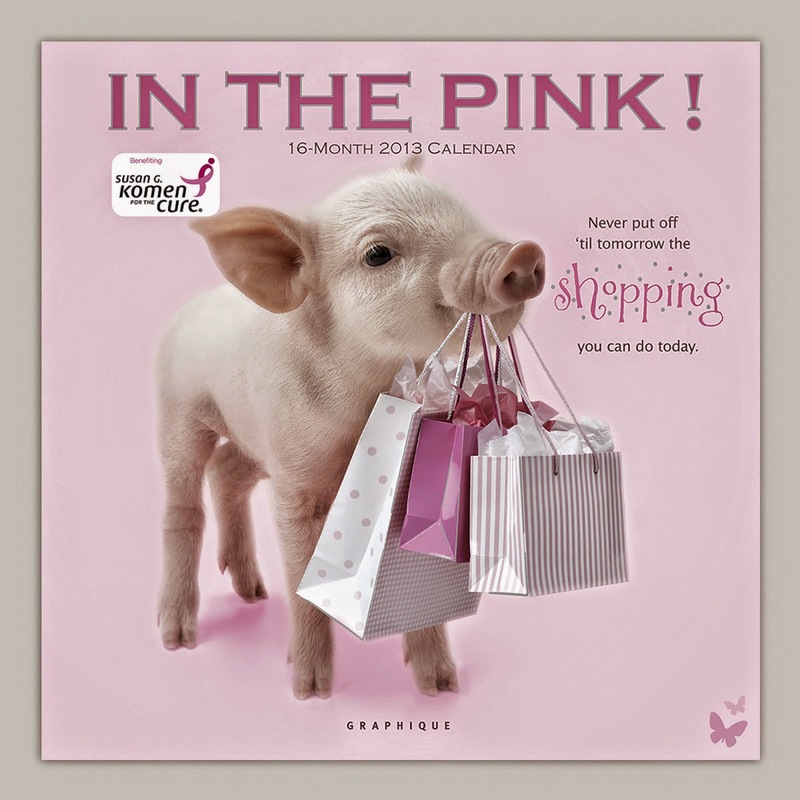 Stay pink and be cheerful! Congrats on your celebration! What a momentous occasion to mark and such a light-hearted way to remember that having fun with the people you love is one of the most important things in life. Dear Colette! Happy anniversary, you're so brave and strong. Your cake looks fantastic!